I'm Juniper, a self-taught artist with a focus on abstract and figurative paintings. I work out of my home studio in Northern Virginia. My husband and I recently bought our first house together and we are in the process of fixing it up one project at a time. It's slow going, (our kitchen cabinets are half painted at the moment) but it's a labor of love. Together we have two little girls. They are the loves of my life and keep me in a constant state of happiness and semi-exhaustion. 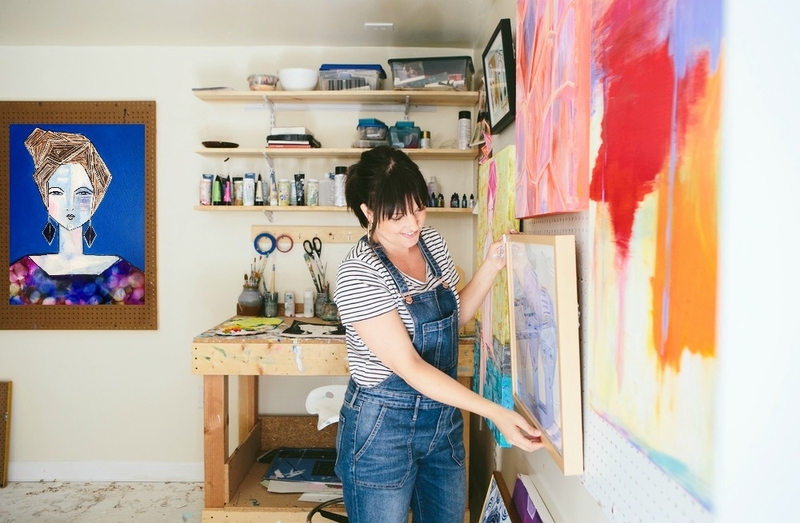 When I'm not painting in my studio or running after the wee ones in my pajamas, you can find me exploring the local farmland, wineries, and museums, hiking the hills, riding bikes, or frequenting my favorite thrift stores and coffeeshops. It's a busy life but a good one. I'm grateful for my family and to be able to do what I love and share my work with others. I work out of my home studio on an easel and work bench that my husband custom built from repurposed wood. My favorite materials include acrylic paint, oil pastels and alcohol ink. 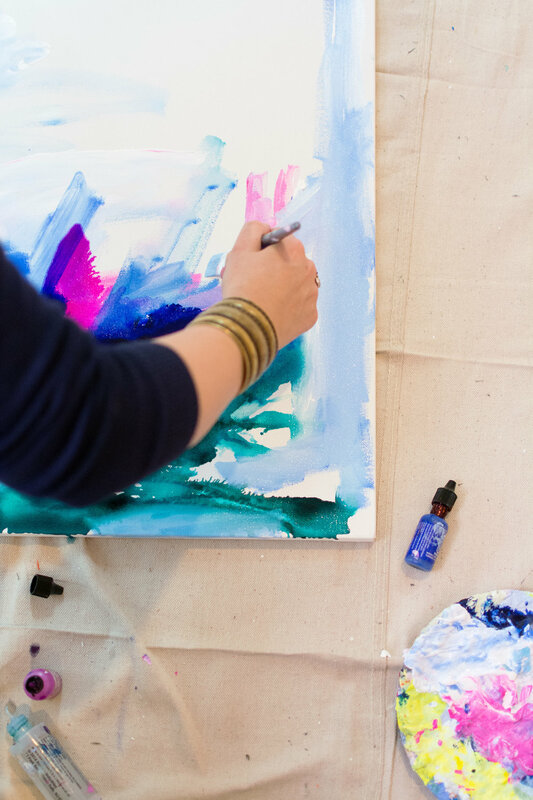 I rely on my intuition to take me through the creative process, working with layers by adding and omitting details to create unexpected and compelling moments. My paintings are playful and energetic, reflecting my interest in flawed beauty, and inner strength rather than perfection. My love of design and composition comes through in my use of shape, movement and bold color choices. I believe in the power of art to evoke emotion and transform a space. I strive to create work that will bring interest and happiness to the viewer. Since the beginning of my career as an artist, I have had the pleasure of working with designers, bloggers, magazine editors, curators, art dealers, home decor websites, shop owners, and galleries, as well as private collectors. One of my favorite things to do is to create custom commissioned pieces for my clients. Contact me with the details of your needs and I will work with you to create a one of a kind painting to fit your specific color pallet, size and style. My artwork is available for private collectors, galleries and interior designers. Let's get started!